The best way to spend the weekend?? Wrapping fabric around rusty metal then dipping it in tea! 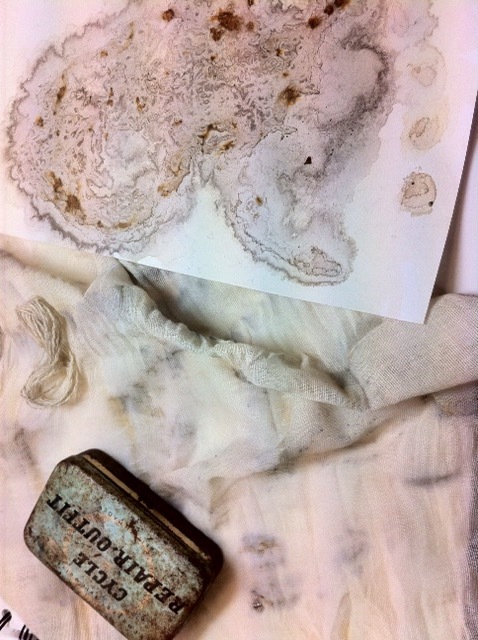 Textile Artist Alice Fox delivered an excellent weekend workshop for me and my fellow Fusionistas. 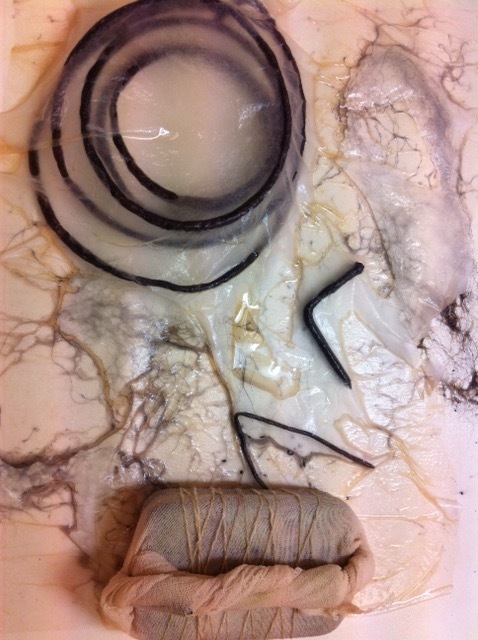 Over the course of the weekend, Alice shared her working practices with us teaching us the alchemical effects of tea and red wine when used to dye fabrics with rust. (We already knew all about the alchemy of imbibing them;). There is a little magic to the process – different teas make different colours emerge and the marks made are unique each time – even if you try to wrap in the same way and use the same liquid. 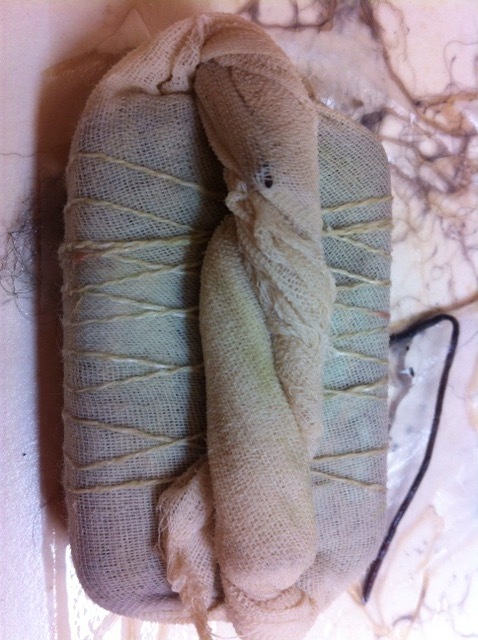 This is the cycle repair tin wrapped in muslin and soaked in tea – there are two small screws tied in the bundles on top. With a different tea (& shorter dye time) the colours achieved were softer than those achieved on my earlier experiments at home. The paper shown here was stained with rust from wire wool. 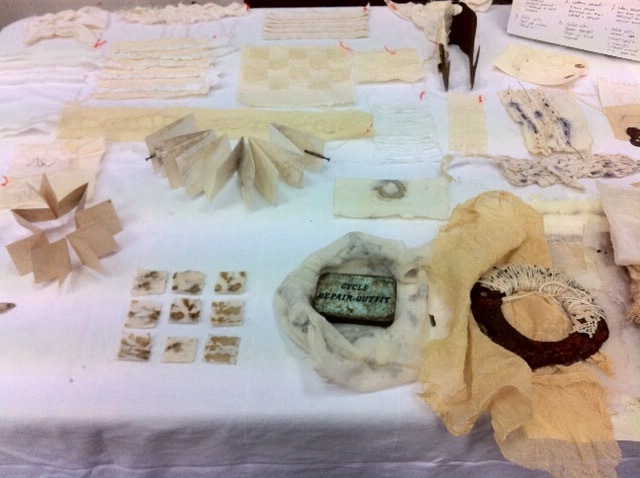 Alice provided us with a range of tasks to complete over the weekend; preparing fabric samples by finding different ways to texture the surface, using the marks created to dictate where and how to stitch, challenging us to redeem perceived ‘failures’ by folding them into books. She talked about her own work, the intentions behind it as well as the process used to create different pieces. The success of the workshop was clear when at the final review we saw how varied the outcomes were for each participant. As with all the best workshops I came away with new techniques to try and new ideas to develop in my own work – I certainly won’t be abandoning my beloved sewing machine anytime soon but Alice’s contemplative approach has given me new insights into my own methods. It was lovely to spend time stitching and thinking with friends old and new, roll on next year’s weekend with mixed media artist Shelley Rhodes ! This entry was posted in artwork, craft workshops, embroidery and tagged Alice Fox, rust on fabric, textile workshop on November 9, 2015 by donnacheshiretextiles.